You can see the steps in a query plan by running the EXPLAIN command. The following example shows a SQL query and the query plan that the EXPLAIN command produces for it. Reading the query plan from the bottom up, you can see each of the logical operations needed to perform the query. For more information, see Query Plan. 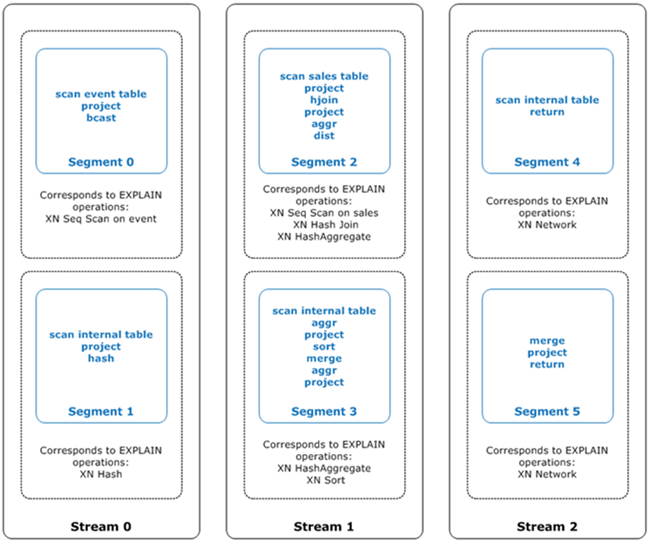 The following illustration uses the preceding query and associated query plan to show how those query operations are mapped to steps, segments, and streams. Each query plan operation maps to multiple steps within the segments, and sometimes to multiple segments within the streams.